Do you have a few favorite “go-to” herbs? Why not grow them in water and keep them close at hand on the kitchen window sill or right on the counter? Water-grown herbs are just as flavorsome as those you grow in the garden. You don’t have to mess with soil or worry about regular watering or changing seasons. Most herbs will be happy growing in water, but those propagated from cuttings are easier to start in water. Seed-grown annuals like cilantro, mustard, and dill are a bit tricky because you need to sow the seeds in soil or some other medium and then transfer the seedlings to water. Soil to water transition is not impossible, but it may not always work out because soil-grown roots are a bit different from water roots. 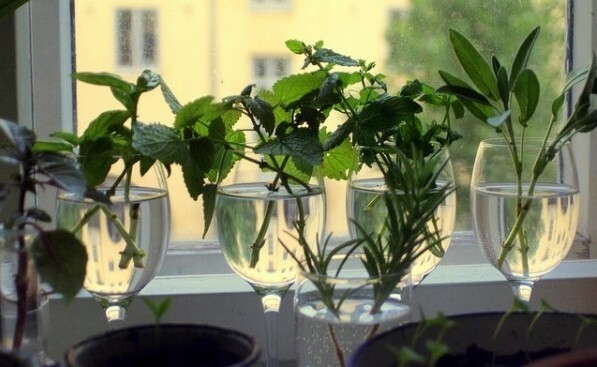 For a simple herb stand in the kitchen, you can root herb cuttings in plain water in glass bottles. Avoid using chlorinated water directly as the bleaching chemical is not exactly friendly to plant tissues. Tap water that has been left to air overnight is fine, so is stored rainwater. Spring water or well water is the best because it has some amount of dissolved minerals that may be of use to plants. As for the container, mason jars or any other glass bottles will do, even plastic bottles. Roots generally like to grow away from light, so colored bottles, especially amber colored ones are best. You can just wrap a piece of paper around the bottle to keep the root zone in the dark. This will even prevent algal growth on the container walls and on the root surface. Algae do not adversely affect plant growth, but they make the bottles look untidy. Narrow-mouthed containers have an advantage: they can support the cuttings and keep them nearly upright. However, the mouth of the container shouldn’t be too narrow or tight-fitting around the cutting. The roots have to breathe, and the mouth of the container should allow free movement of air. If you’re using a wide-mouthed container, you have the option of covering the top with nylon or wire netting. Insert the cuttings through the holes, and that will offer some support to the cuttings. Another advantage, especially in warmer areas, is that the netting prevents mosquitoes from laying eggs in the water and multiplying. Soft cuttings are pretty quick to root in water. You don’t need to use any rooting hormones. If you have some herbs growing in the garden, snip off 6-inch sections from growing tips and put them in the water-filled containers. The best part of growing herbs from cuttings is that you can use the ones you get from the supermarket. Just wash them in plain water and cut off the lower portion. Remove lower leaves from cuttings and trim the lower tips close to the nodes from where the roots arise. When they are inserted into the bottles, there shouldn’t be any leaves touching the water. They can rot easily and spoil the water, as they do in flower vases. Woody cuttings like rosemary may take longer to root, so be patient. Change the water once a week without disturbing the cuttings. Once the roots start growing, usually between 2-6 weeks, water changes may not be necessary. If you have willow trees in the garden, you can steep some branches in warm water overnight to make a natural rooting hormone mix. Place the cuttings in the infusion to encourage rooting. Alternately, rooting hormone powder can be used. 1. Peppermint – This is the most popular mint for medicinal uses because it contains high amounts of the volatile substance menthol. It gives a unique cooling sensation on the skin or tongue, but without actually causing any temperature variation. Growing peppermint in water is easy; just put fresh cuttings in water to grow new plants. 2. Spearmint – This is another mint variety closely related to peppermint. In fact, peppermint is a natural hybrid of spearmint and an aquatic mint that is commonly known as water mint. 3. Oregano – This pungent herb is worth growing indoors because you can use the leaves to flavor almost any vegetable. Take cuttings of fresh growth and pot them up in water. Start pinching the growing tips as soon as the plant starts to grow well. 4. Basil – Basil would love the warmth of your kitchen and grow happily in a water-filled container as long as you provide it good light. Take cuttings any time before it starts flowering. If you have several varieties of basil, growing cuttings in water is the best way to preserve your collection during winter. 5. Sage – Take soft cuttings in the spring and root them in water. You may need only one or two sage plants because only very tiny amounts are needed to impart flavor. Keep the plants in bright light and in a well-aerated place because this herb is prone to mildew. 6. Stevia – This sweet plant is good to have in the house to add to freshly brewed teas and beverages. Take cuttings of actively growing soft branches and place them in water. Provide a warm place and as much light as possible to keep this tropical plant happy and full of sweetness. 7. Lemon balm – The lemony scent of this mint-family herb is a welcome treat in any home, especially in the winter. The leaves are great for making tea. Take cuttings in spring or fall. Keep the containers in a warm place that receives plenty of bright indirect light. They may take up to 3-4 weeks to develop roots. Keep the water clean with regular changes. Some people find it easier to root the cuttings outside the house when the weather’s still warm. 8. Tarragon – Take cuttings in the spring after new growth appears. Fall cuttings are fine too, but they may take longer to grow roots. Keep cuttings in a warm place that gets bright light. French tarragon is best as a culinary herb. Russian tarragon is milder, or even bland, so use it as a green in salads. 9. Thyme – You need to take cuttings of new growth that is green in color. The old growth that has become stiff and brown may not sprout roots easily. The best time to take the cuttings is mid-spring to early summer, before the plant starts flowering. The thin stems of thyme can dry out very fast, so put them in water as soon as you cut them. Spray the portion above the water, if necessary. Once it starts growing, cut the stems to promote branching. 10. Rosemary – The semi-woody cuttings of rosemary take longer to root, but spring cuttings of new shoots may be faster. Either way, it is worth the effort because rosemary makes an excellent indoor plant for a sunny spot. Not just herbs, but other houseplants do equally well in water. Just perfect for you if you regularly kill houseplants by over watering them or forgetting to water altogether. You don’t need to make any special arrangements when you go off for a few days. Pothos – This plant is commonly grown in water. Take tip cuttings of any length and put the cut end into some water making sure that 2-3 nodes are submerged in water. Arrowhead – This plant is similar to pothos. Tip cuttings can be potted up with a few nodes below the water level. Philodendrons – Dainty heart-leaved philodendrons, as well as the large, split-leaved types do equally well in water. Take 6-8 inch cuttings of growing tips and put in a container that can support its weight. You may need to place a piece of rock in the container to prevent accidental tipping. Peace lily – You can pot up divisions or use an entire plant growing in a pot. Just wash off all the soil from the roots and put it in a bowl of water. Aluminum plant – Cuttings of this beautiful plant with silver markings do very well in water. Dracena – The plant commonly grown in water as Chinese lucky bamboo incidentally is no bamboo, but a variety of dracaena (Dracaena braunii). Others like corn plant (D. fragrans), Song of India (D. reflexa) are good choices. Sections of the cane can be rooted and grown in water, but support is essential for these top heavy plants. Dieffenbachia (Dumb cane) – Cut top growth and pot up in water after the cut end becomes dry. Care must be taken while handling this plant; its sap is so caustic, it can burn your skin. Chinese evergreen (Aglaonema) – Take cuttings or clean whole plants growing in pots and put them in large containers of water. Chlorophytum (Spider plant, Airplane plant) – Put large plantlets or entire plants cleaned of all soil particles in goldfish bowls full of water. Water culture is best for hanging plants because you don’t need to water them often. Watercress, water chestnut, wasabi, and lotus are some of the food plants that naturally grow in water. But many terrestrial vegetables can adapt to growing in water. Some, like leafy greens like lettuce and spinach, do extremely well. They seem to be happier than their counterparts growing in the ground because they get a continuous supply of water and are not bothered by soil pathogens. Lettuce – This is the most favorite vegetable of hydroponic farmers. The easiest way to grow them hydroponically is to start the seeds in netted cups. When they are bigger, insert them into the beds containing growing medium. Spinach – This leafy vegetable is grown the same way as lettuce. Tomatoes – Tomato seeds started in individual cups are inserted into the growing medium. High yields are typical of hydroponically cultivated tomatoes. Peppers – Their cultural requirements are similar to tomatoes. Cucumbers – Bush type cucumbers are preferred for hydroponics; the climbing type would need extra support. Celery – Being able to grow celery without soil is a bonus; it means no dirt deposited in the leaf bases. It makes cleaning the vegetable very easy. Plants growing in plain water will soon exhaust what little mineral nutrients the water may contain. Since they don’t have access to the nutrients naturally occurring in soil, they need supplemental nutrition to do well. Regular fertilizers diluted in water or proprietary formulations designed for hydroponics can be used at regular intervals. When you use fertilizers to feed water grown plants, they leave some residues that may accumulate in the water and on the roots, causing root burn. Change the water at regular intervals and flush the plants and the containers occasionally. Soil has some functions other than providing minerals required for plant growth,. It supports the plants and provides a medium for anchoring the roots. When plants are grown without soil, the lack of proper support can be a limiting factor. Soil acts as a reservoir of water and fertilizers added to it, and then releases both in a controlled manner. Inert natural media like sand, gravel, perlite, vermiculite coconut fiber, and coconut chips are sometimes added to water containers to serve as support. Some products like lightweight expanded clay and rock wool are specially manufactured for this purpose. Plants grown in a hydroponic medium seem to appreciate the physical support they get. Special nutrient formulations are mixed with water to provide continuous nourishment to the plants. That’s why hydroponic systems typically give very high yield. Wick system – The plants grow in tubs filled with an absorbent medium like coco-peat that can wick up nutrient-rich water from a bottom reservoir. It is somewhat like growing plants in soil, except that the nutrients come from the water, not the medium. Deep Water Culture – It is almost same as the simple system described for growing plants directly in containers of water. The roots remain suspended in water, but the plants are actually growing in another container partially immersed in the main water container. Sometimes Styrofoam sheets with holes are used for suspending the plants. The water in the main container is agitated or aerated with an aquarium pump. This extra aeration to the root zone helps reduce disease and keeps the roots healthy and strong. The main drawback is that power is required to run the system. Instead of allowing the roots to remain submerged in water all the time, different types of arrangements for intermittent exposure have been developed. This allows more air-circulation around the roots, helping reduce root zone diseases. Falling water – Nutrient solution is supplied to the beds from overhead sprinklers. It percolates down by gravity and gets recirculated. The root zone gets good air circulation, but the system involves pumping water for recirculation. Flood and drain – The plants growing in the bed of inert medium are watered by intermittent flooding of the beds with the nutrient solution. The bed is them allowed to drain, exposing the roots to air. This is an improvement on hydroponics where growing medium is done away with. Plants are grown in holes cut into large pipes so that their roots remain inside the pipe. Nutrient solution is sprayed on to this root zone. This is a combination of hydroponics and aquaculture in which fish and other aquatic life are grown. It does away with the proprietary nutrient solutions used in hydroponics, replacing it with the nutrient-rich water discarded from aquaculture tanks. The system uses an inert medium that gets colonized by microorganisms capable of breaking down aquaculture waste products. The water thus cleaned and filtered by the hydroponic bed gets recirculated into the aquaculture tanks. A simple replication of aquaponics would be growing herbs, watercress or microgreens on Styrofoam sheets floating in an aquarium tank with their roots absorbing the nutrients generated from fish waste.